The Comet Assay Extension in the Aphelion™ Imaging Software Suite provides support for the Single Cell Gel Electrophoresis (SCGE) comet assay. This simple test is used in oncology to predict the intrinsic radio-sensitivity of tumors, or for the study of individual sensitivity to genotoxic agents. It is also used in genetic toxicology to quantize DNA damage in high-risk populations (for example farmers, smokers, or workers in a controlled environment). The comet assay quantifies the ratio of simple and double DNA breaks within individual cells. It is based on the capability of DNA fragments with a negative load to migrate through an agarose gel when an electric field is applied. One of the main benefits of this assay is that it is inexpensive, as only 1000 to 10000 cells are enough to unveil a DNA break for 1010 daltons. The assay can reveal 100 breaks per cell on average. To prepare images for further image processing, cells are placed on a microscope plate before electrophoresis. After rinsing the plates, DNA is marked with a fluorescent dye (e.g. ethidium, bromure, and acridine). The plate is then placed under a fluorescent microscope for analysis. In damaged cells, broken DNA spreads towards the anode part of the electrophoresis device, displaying a comet-like shape with an intense head and a diffused tail. The length and intensity of the comet tail vary by function of the broken DNA. Healthy and intact nuclei retain the shape of a disk. Using the software, images can be automatically segmented, and normal, damaged, and highly damaged cells (HDC) are detected and then analyzed. Comet Assay is an extension for Aphelion Dev that performs image processing and image analysis on digital images captured with the optical microscope and stored on a computer. 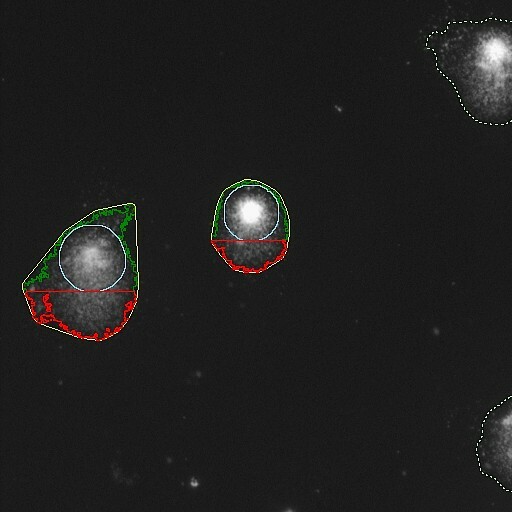 Comet Assay extension is an automatic tool to segment and analyze cells. 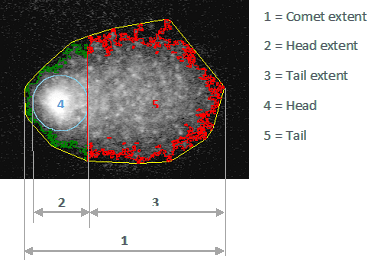 It includes a fully automatic, powerful, and innovative segmentation process that is independent of illumination, an editing tool to manually annotate the segmentation result if desired, and an automatic analysis module to extract shape and density measures on a cell by cell basis. This analysis extracts the head and the tail of a cell and analyzes each part independent of the other. These measurements give the biologist a good estimate of the “spread” of the cell. The figure below provides a graphic explanation of some of the main measurements presented in the list above. The Comet Assay Extension supports many image formats (e.g., Tiff, Jpeg, Dib and CO1 format) with 8 and 12 bit images. All measurements are saved as Aphelion ObjectSet files. They can also be exported as a Microsoft Excel or CSV file type for further statistical analysis. Comet Assay Extension requires a valid license for Aphelion Dev. It can be installed on any personal computer running Windows® 7 or higher. Images need to be accessible from a hard drive or from network storage, and organized in folders to be processed by the software. All Comet Assay Extension measurements are calibrated in micrometer units and output in real-world units. Feel free to contact us to get further information about Aphelion Comet Assay Extension. Link to download Aphelion Comet Assay Extension flyer is available at the bottom of this page.